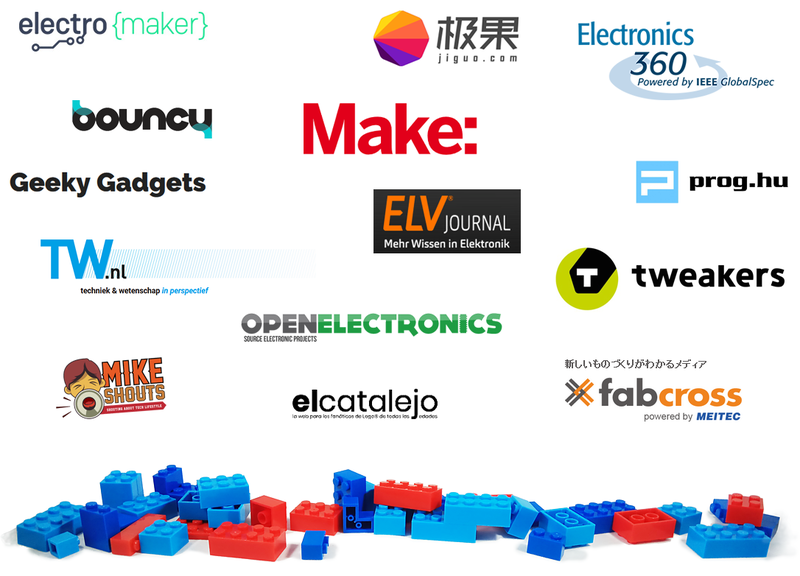 Peguino integrates the worlds of toy bricks and micro computer technology: Raspberry Pi and Arduino™. The Peguino parts contain Arduino™ and Raspberry Pi compatible electronics and fits them physically into industry compatible toy brick cases. 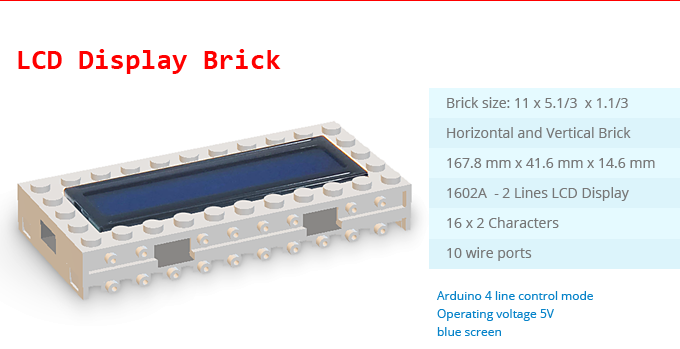 Peguino delivers brick shaped cases for the most common Arduino™ electronic components to enhance brick projects and open them to endless possibilities. Peguino contains the visual software creation tool Visuino and the Rockbotic™ experience to deliver the most seamless way to learn. To play. To invent! With Peguino - you are the inventor! But that´s not all: With the Peguino Remote Brick ( RC ) you can build a real remote controlled RC brick model. Fully Flysky comaptible! 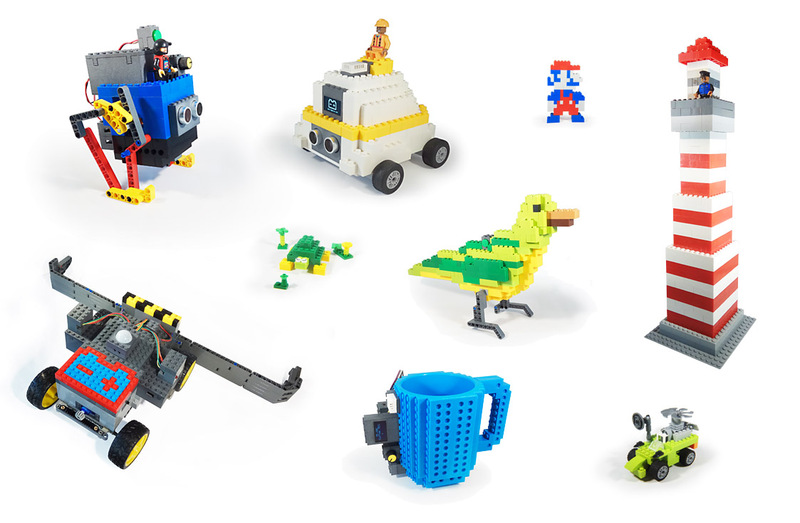 With Arduino™ (or Raspberry Pi) and toy bricks combined, there are virtually no restrictions for makers. 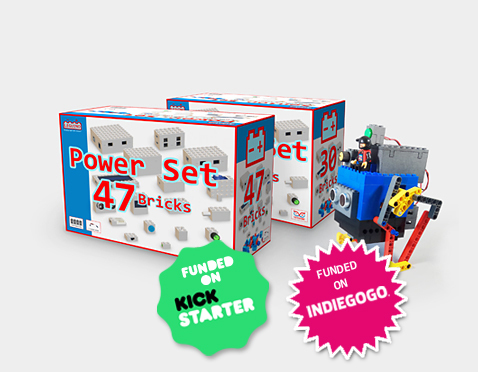 Use your toy builder skills and combine them with the endless range of elecronic hardware and possibilities. Build whatever you desire. But don´t waste time and effort building fiddly cases, drilling holes or other time consuming hardware, reduce time and effort and apply Peguino bricks to your next level of masterpieces. Take some toy bricks and start building. Make your prototypes simple by using toy bricks and integrate unique Peguino devices with crazy functions: Microphones, infrared data transfer, OLED displays, humidity sensors or why not or a real webserver? Connect your self built project to the Internet and override all limitations. 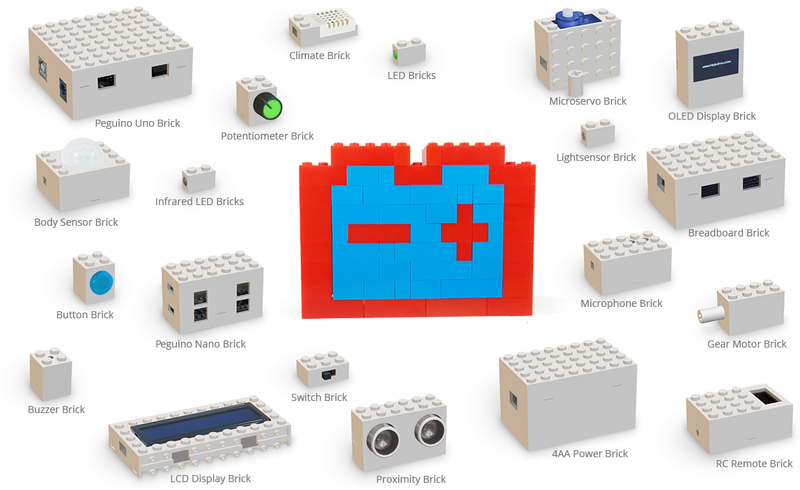 Go and build your personal toy brick and Arduino™ (or Raspberry Pi) Internet of Things solution! Our Peguino parts deliver the bridge. 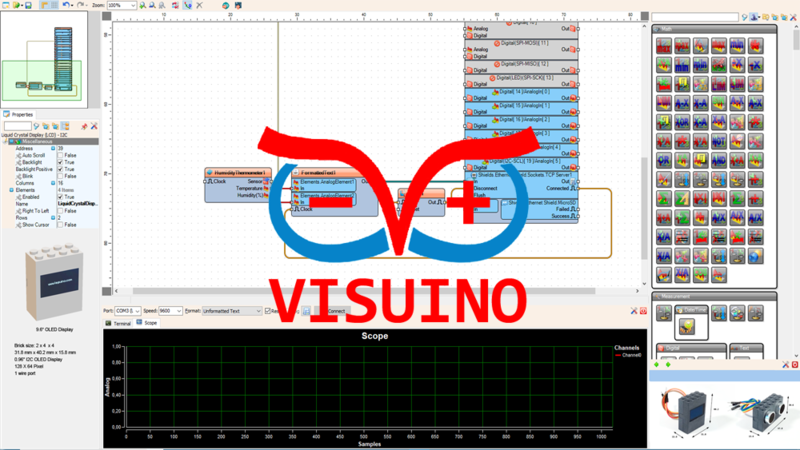 By integrating the Peguino Visuino visual development environment you can create endless complex solutions without writing one single line of code! Don´t waste time to learn programming first. 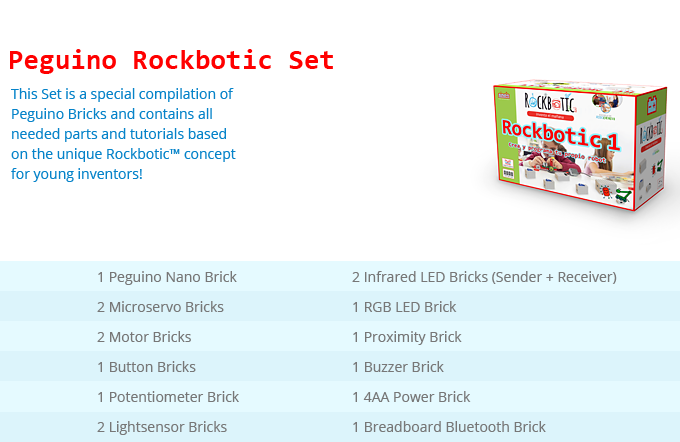 But Visuino and Peguino is also your invitation to learn coding: Based on Rockbotic™ concept - there we collected experience to learn, to play and invent with over 4000 students right now! This rich experience is included in each Peguino solution. The Peguino bricks inside Visuino represent their hardware components and you will easily be able to create and design your programs using drag and drop. 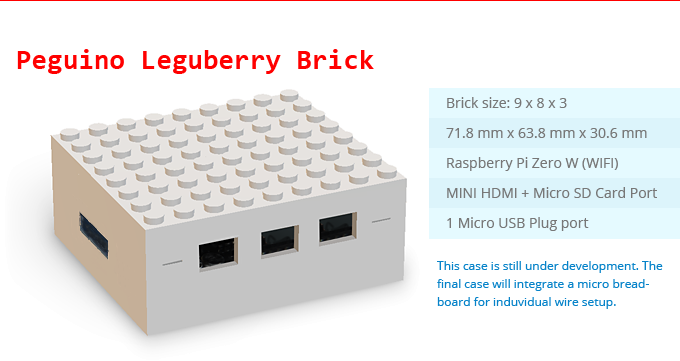 Once you have completed your design, connect the (main) Peguino Brick inside your project, upload and run your new invention. For those people who are not skilled in writing software, developing programs has never been easier! Instead of wasting time on writing hundreds of lines of programming code – Visuino does all the hard work for you. Just focus on what you will build with bricks, wire them together and see it running in minutes! 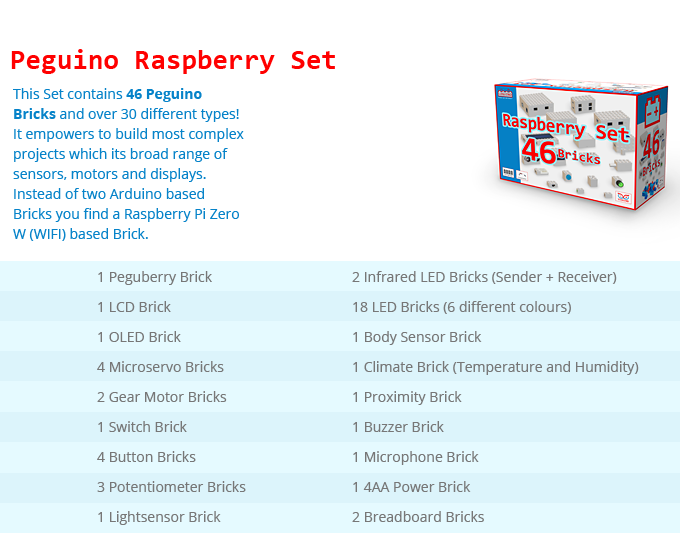 Inventing software with Peguino Visuino is as easy as connecting toy bricks. This toy brick compatible Peguino unit houses and delivers the core control processing unit for your projects. It contains the most robust Arduino Uno Type microcomputer board to control your project. With the 14 Digital I/O Pins (of which 6 provide PWM output) and its 6 Analog Input Pins is enough external connection possible for complex projects. It contains a 16 MHz ATmega328 CPU and 32KB Flash memory. You can connect it to your computer directly via a USB connection and install your own programs. It is the optimal core Peguino brick to get started. This toy brick compatible Peguino unit houses and delivers the micro version of the core control processing unit for your projects. It contains a mini Mini-B USB cable plug. The specs are mainly similar and compatible to the Peguino Uno Brick, but it has no separate power jack. It contains 22 Digital I/O Pins of which are 8 Analog Input Pins. It is the sub sized board for enhanced projects. This toy brick compatible Peguino unit houses and delivers a Raspberry Pi version of the core control processing unit for your projects. It contains a mini Mini-B USB cable plug. The technical specs are similar and compatible to the Raspberry Pi Zero W (WIFI). This toy brick compatible Peguino unit houses and delivers a text display into the center of your project. 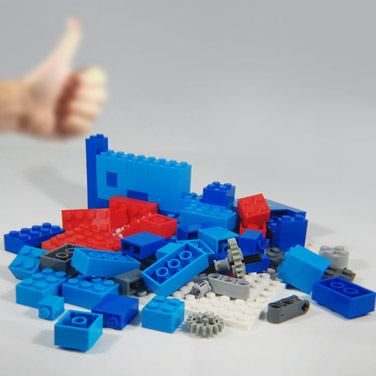 With its unique designed brick case it can be used standing upright or lying down to allow a broad range of toy brick project integration variations e.g. as a text display on your Peguino weather station. This toy brick compatible Peguino unit houses and delivers your graphical display for more enhanced projects. Beside of text output it allows you to show scientific pie-charts or a smiling face on this display e.g. provide feedback to a reaction tester project. This toy brick compatible Peguino unit houses and delivers precise servo mechanical movement into your project. With its unique designed case it can be used standing upright or lying down to allow a broad range of project integration variations. It contains a axle adaptor to integrate it into all rotating and moving parts e.g. to move the arm of your robot project. This toy brick compatible Peguino unit houses and delivers a seamless motor to drive the wheels on any project. It integrates a gear to provide strong low rotation force. It contains a axle adaptor to integrate it into all rotating bits, wheels and gears e.g. to spin the wheels on your car project. This toy brick compatible Peguino unit houses and delivers a switch to create a on/off control e.g. to turn on power. This toy brick compatible Peguino unit houses and delivers a push-button switch to kick off user input e.g. to build a doorbell project. This toy brick compatible Peguino unit houses and delivers a variable (resistor) control unit to deliver specific adjustable input to your project, eg. a light dimmer. This toy brick compatible Peguino unit houses and delivers a light sensor to detect environmental light and input it to your central unit. You can automatically light up your toy brick castle as darkness falls. This toy brick compatible Peguino units houses and delivers a set of two LEDs to send / receive infrared light to control your system e.g. invisible infrared Wiretap Alarm or use a remote device to turn on your project. This toy brick compatible Peguino unit houses and delivers one of six different coloured lights to enhance and light up your project eg. traffic lights, x-mas tree or the lights on your toy brick car. This toy brick compatible Peguino unit houses and delivers a passive infrared sensor to detect body movement to enable your project e.g. to greet you when you arrive. 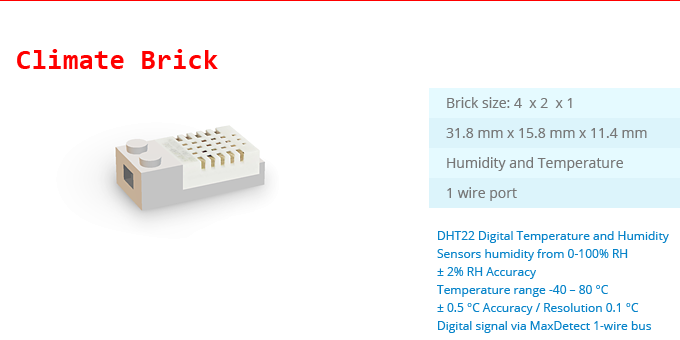 This toy brick compatible Peguino unit houses and delivers a temperature and humidity sensor e.g. use in a weather station or a mini green house. 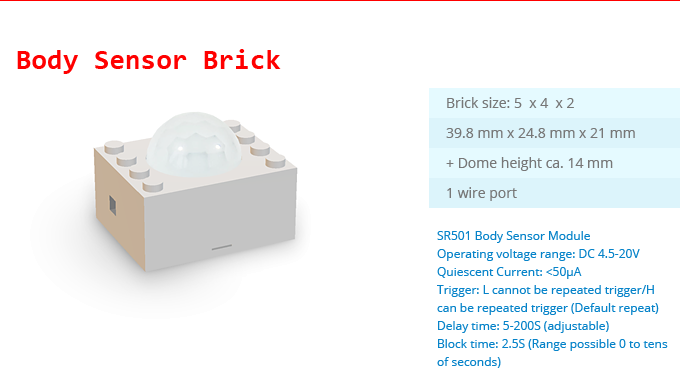 This toy brick compatible Peguino unit houses and delivers a proximity brick which measures distance with ultrasonic Doppler Effect waves enabling your self driving robot to avoid walls. This toy brick compatible Peguino unit houses and delivers a speaker type unit to deliver acoustic signals eg. door bell alarm or a ringtone. This toy brick compatible Peguino unit houses and delivers a microphone to enable your project to listen and respond to acoustic signals eg. hand clap interaction. 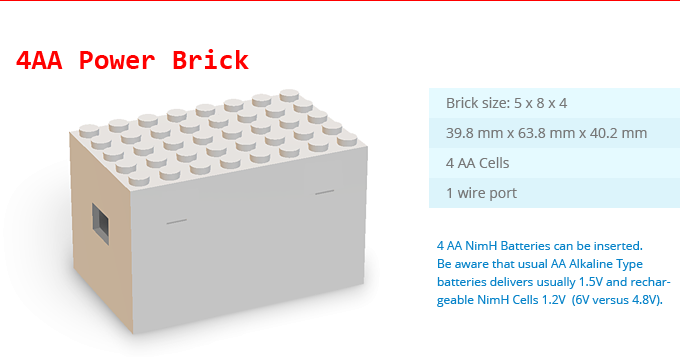 This toy brick compatible Peguino unit houses and delivers a discrete integrated case for batteries that powers your project. 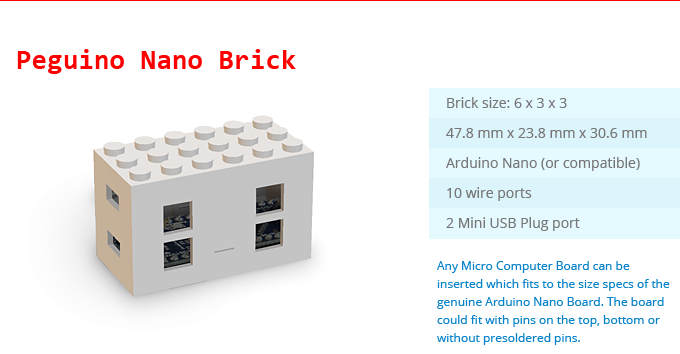 This toy brick compatible Peguino unit houses and delivers a reusable array of 170 connection points to build your own electrical circuit to interconnect all your Peguino bricks without soldering. This toy brick compatible Peguino unit houses and delivers a Remote Control Receiver to build your own brick race car. It is compatible to the universal Fly Sky standard transmitters and compatibles. This Set is the low barrier entry level into the word of frictionless tinkering. It contains all the fundamental Peguino parts for a moving or (inter-) acting project. 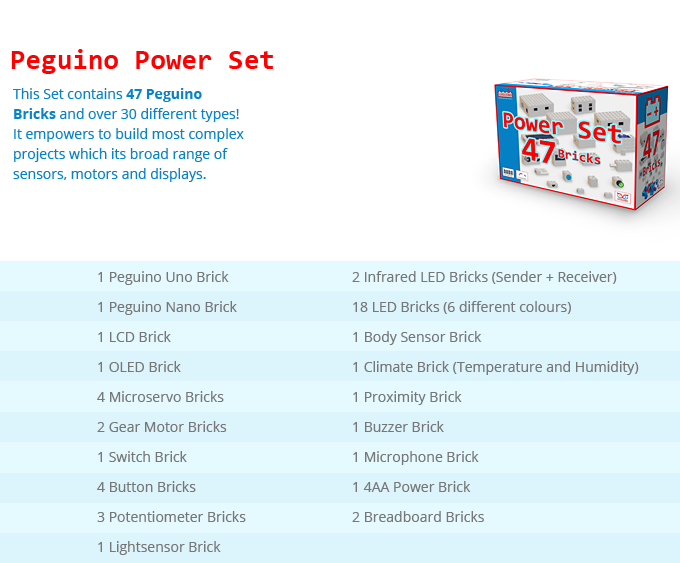 You can display written informations, make physical movements with the Microservo Brick or switch lights on, all controlled from the powerful heart of the system: the Peguino Uno Brick. 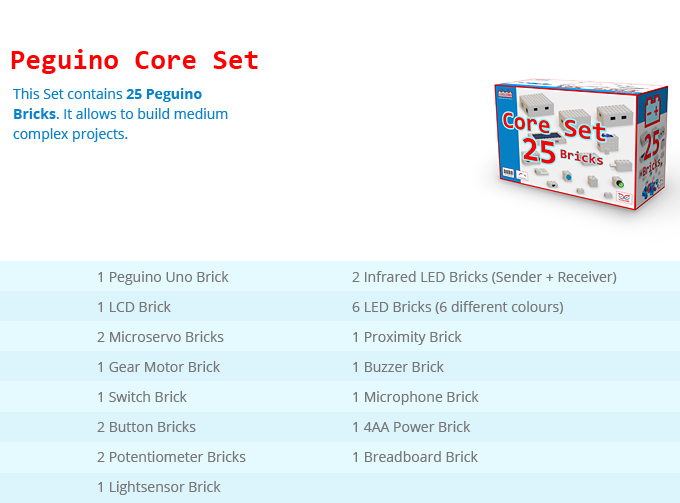 This Set contains 25 Peguino Bricks. It allows to build medium complex projects. The Peguino Core Set contains everything you need to build powerful computerized projects. You can drive and steer autonomous vehicles and they can react on their environment. Build your robot which has the intelligence of a real robot. You can react on acoustic signals and communicate wireless with the Peguino Infrared LED Bricks. Display Text or let your project make noise with the Peguino Buzzer Brick. Everything is controlled by the powerful brain of the system: the Peguino Uno Brick. 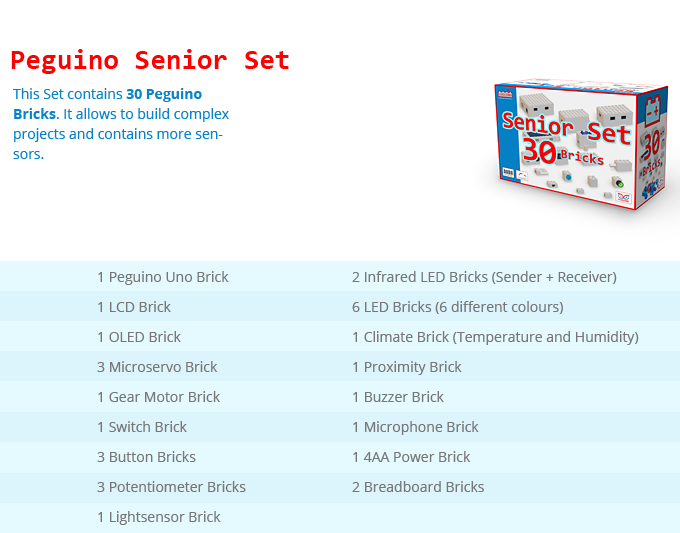 With the Peguino senior set you have the tools for scientific grade brick projects. Your project can even respond to temperature or air humidity. Measure and control your projects with this Set and show the results on a text display or interact with animated graphical smilies on the Peguino OLED Display Brick. The possibilities are nearly endless. It´s core computer is the Peguino Uno Brick. Hold your breath: This Peguino Power set is the key to construct the most powerful toy brick projects. It contains two computers: The Peguino Uno Brick and his smaller brother, the Peguino Nano Brick. You can let both communicate with each other to control two (or even more) projects simultaneously. 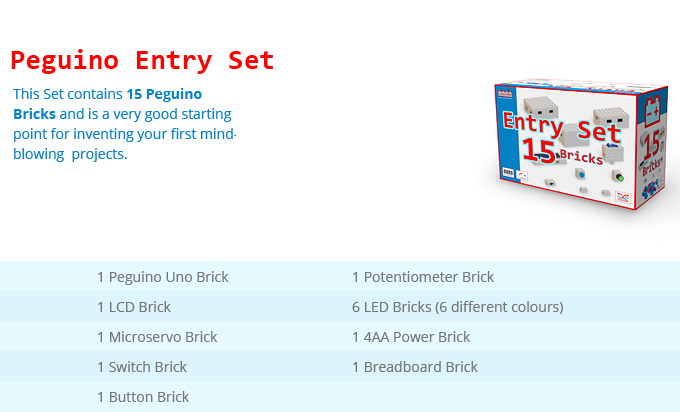 This Set contains the full range of Peguino Bricks. It contains the unique Peguino Body Sensor Brick to detect people (by emitting body temperature) in close proximity. It challenges the scientist in you. This powerful Set is comparable with the Peguino Power Set. Instead of two Peguino main units it contains one Raspberry Pi compatible computer. You can run the Linux operating system and communicate to the internet via WIFI. It is your secret weapon to build unexpected masterpieces. It empowers you to build breathtaking brick projects. This Set is the result of working with over 4000 students in over 100 schools until now. Here we have all the knowledge and experience collected to learn young students how to invent. We call it the Rockbotic™ concept. It has special wiring and reduced mechanical complexity to give students and teachers the most frictionless experience while inventing. This Kit enables you to build the unique Peguino Thermometer. 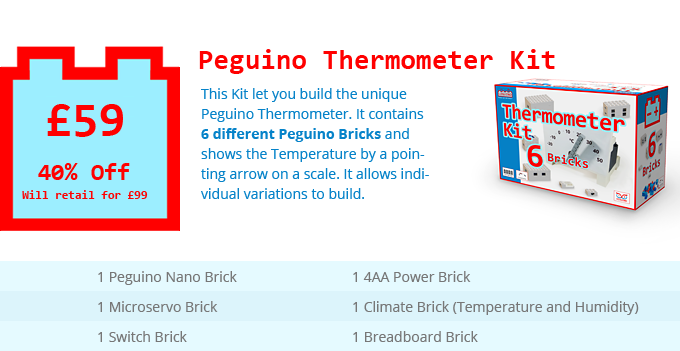 It contains 6 different Peguino Bricks and displays the temperature via a pointing arrow on a scale. It allows individual variations to build e.g. it lets you adjust the temperature range to your environment. The Peguino Nano Brick is already preprogrammed. You need no programming skills to build. 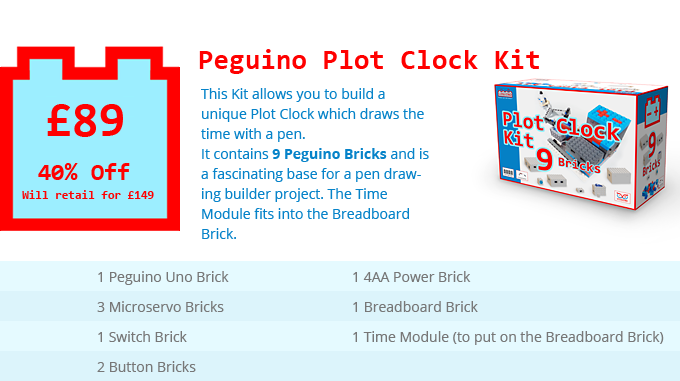 This Kit allows you to build a unique Plot Clock which draws the time with a pen. It contains 9 Peguino Bricks and it is a fascinating base for a pen drawing builder project. The Time Module fits into the Peguino Breadboard Brick and is a unique part of this Kit. The Peguino Uno Brick is already preprogrammed. You need no programming skills to build. 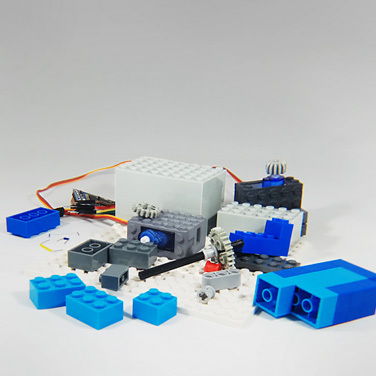 With the Peguino RC Model Kit you can build your own toy brick based RC Model. It contains a FLY SKY FS-R6B 2.4 Ghz 6 Channel Receiver which works with all kind of Flysky compatible RC Transmitters (eg. Flysky FS-i6 2.4 Ghz 6ch Transmitter). Get control over your projects wireless. The Peguino Vision started with a very straight forward approach: Merging simple tools together to empower people to overcome obstacles while inventing. The Peguino belief is that by lowering barriers more and more people can develop their dream projects and follow their own ideas and inspirations. Ones‘ age or manual skills may not restrict anymore. Peguino - you are the inventor! The Peguino concept allows the compatibility to industry standard and LEGO® bricks and merges them to allow the pursuit of endless joy: Arduino™, Raspberry™ or Fly Sky RC-Modelling. It allows your projects to expand endlessly with your own bricks. Peguino is is a independent company. The following copyrights or trademarks are owned by: ARDUINO® is a trademark of Arduino AG, LEGO® is a trademarks of the LEGO Group, Raspberry Pi is a trademark of the Raspberry Pi Foundation, Flysky by ShenZhen Flysky Technology Co.,Ltd.and Peguino is a trademark of Peguino Ltd. Copyright © 2018 Peguino LTD. All rights reserved.